Ever wonder how long to bake chicken leg quarters, thighs, or legs? This post will tell you just that plus the difference in various cuts, and how to best cook them. It’s no secret that I love chicken legs, and I know you all do, too! One of the most popular recipes on my site is The Best Baked Chicken Legs. It’s safe to say that chicken legs, along with other dark meat cuts such as chicken thighs and chicken leg quarters, are a family favorite. But why? Have you ever wondered how dark meat is different from white meat? How long to bake chicken leg quarters? Wait, what the heck is a chicken leg quarter? I’m here to help! I’m here to convert you to the wonderful world of dark meat chicken! I know some of you aren’t here for info, you are here for a recipe. You can find my favorite easy chicken leg quarter recipe here. Q: What’s the difference among the various cuts of chicken? A: A chicken leg technically includes both the thigh and the drumstick (the lower portion of the leg, often referred to as just a chicken leg). Of course you can get both of those separately as well. So what is a chicken leg quarter? It’s the full leg (thigh and drumette) plus a portion of the back. (Check out this awesome breakdown of chicken cuts with photos on chicken.org). Q: Why choose chicken legs, chicken thighs, or chicken leg quarters? Reason 2: It’s extremely moist – because it often cooks on the bone, in the skin, and with the fat, it comes out very moist and flavorful. 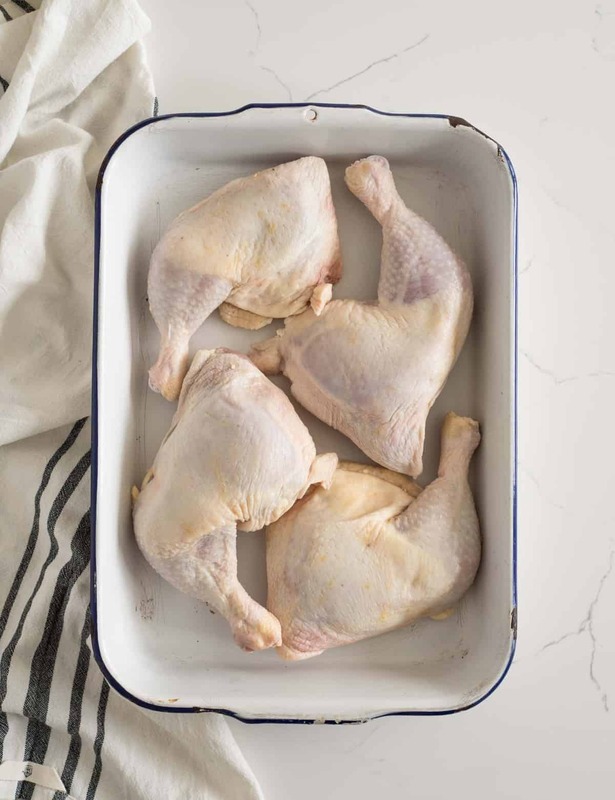 If you’re not careful, white meat can quickly become overcooked and too dry, but dark meat is almost impossible to dry out! Reason 3: It’s versatile – almost any chicken dish can be made with dark meat cuts. Reason 4: It’s delicious! In my opinion, dark meat is more flavorful than white meat and pairs so wonderfully with so many flavors. Q: How long do you bake chicken leg quarters, chicken thighs, and chicken legs? A: Of course it depends on the temperature of your oven, but I usually bake at 375 degrees for 45-60 minutes. The ultimate goal is for the internal temperature to reach 165 degrees Fahrenheit in the thickest part of the meat. If you don’t already have a meat thermometer, get one. Right now. It’s SO helpful to make sure you don’t overcook your meat, while still making sure it’s safe. 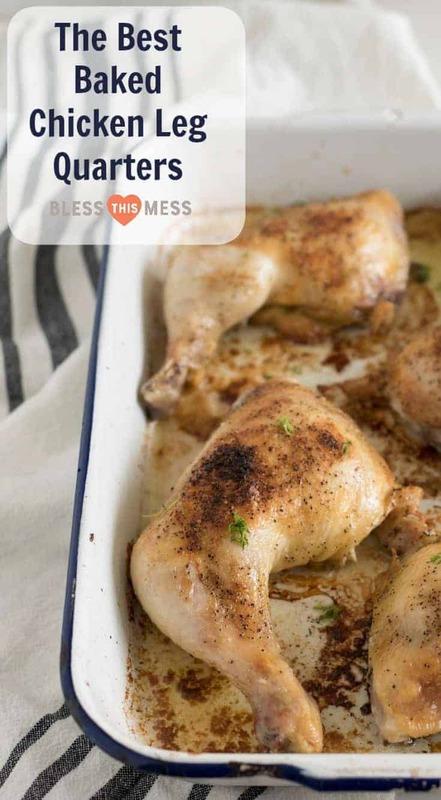 A. I love this recipe: The Best Oven Baked Chicken Leg Quarters because it’s simple, easy to make, and you can customize the seasoning bled to meet your likes and needs. Q: Now that I have a delicious baked chicken recipe on the table, what do I serve it with? Options 1: Best Baked Chicken Legs served with cooked rice and steamed broccoli and cauliflower. Serve the leftover sauce that the chicken baked in over the rice and veggies. It’s so good! Option 2: The Best Oven Baked Chicken Leg Quarters are great with pasta salad of all kinds and a watermelon + corn on the cob to go with it. Option 3: Crispy Baked Chicken Drumsticks with a Pretzel Coating are perfect with baked potatoes with a simple side salad with your favorite salad dressing recipe to go with it. Option 4: Simple Oven Roasted Chicken Drumsticks are great with oven fries (baked potato wedges), Midwestern Creamy Cucumber and Vinegar Salad, and some Grilled Corn and Avocado Salad on the side. Throw in some fresh peaches for good measure. If you can’t tell, I’m in love with dark meat chicken cuts and I hope I’ve convinced you to try them out if you aren’t yet converted – your wallet and your taste buds will thank me! What are your favorite chicken leg quarters recipes? I’m impressed by your recipes. I love how you detail everything and break it down so that we can fully understand the directions. I’m looking forward to seeing more of your meal plans. If I click your website for a recipe, all I want is the damn recipe. The rest of this is just frustrating noise. If you are looking for a more solid recipe and less educational material, here’s a great chicken leg quarter recipe for you. Bless your heart, it’s a FREE blog, Bob… FREE. Don’t want to read? Then there’s a gazzliion other google recipes. Keep writing your heart out, Melissa!